Successfully Added Doogee F7 Pro Smartphone - Android 6.0, Deca-Core CPU, 4GB RAM, 5.7 Inch 1080p Display, 4G, Double IMEI, 21MP Camera (Black) to your Shopping Cart. With the launch of the Doogee F7 Pro the company has introduced us to its latest flagship phone that does not only look stunning from the outside but also features powerful hardware that is guaranteed to impress. With its stunning metal uni-body frame and large 5.7 inch FHD display this Android smartphone is a true eye-catcher. Featuring an Android 6 operating system, the latest break-through technologies, and a phablet-sized display, while staying light in weight – this Chinese smartphone offers the perfect platform on which to enjoy year’s worth of entertainment. Holding an impressive Deca-Core CPU, Mali T880 GPU, and 4GB of RAM the Doogee F7 smartphone is a true power horse that is capable of meeting all your multi-tasking demands. 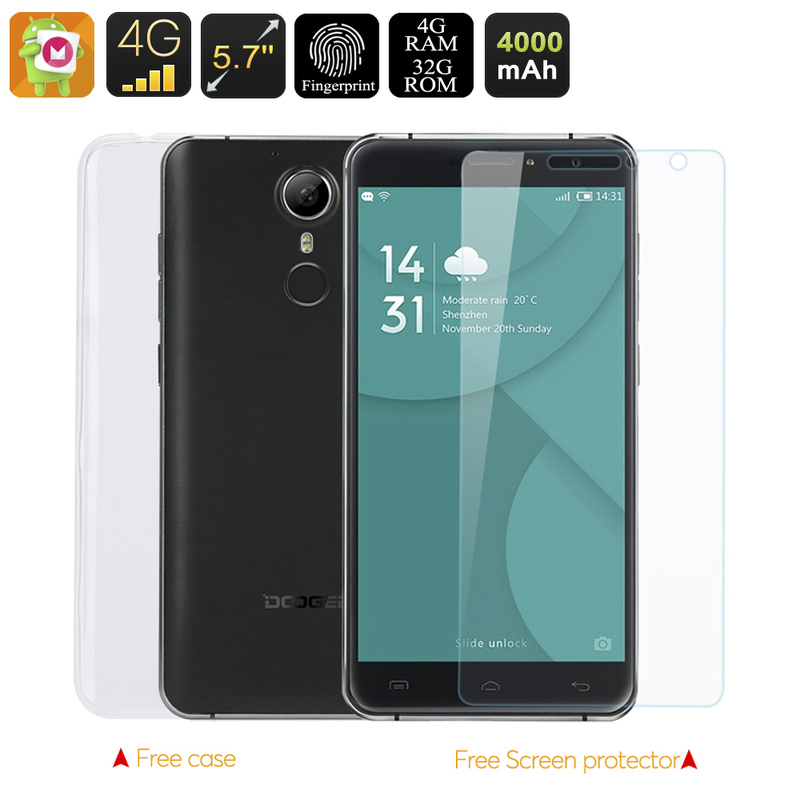 Its large 5.7 inch Phablet sized display features a 1080p screen resolution, allowing you to enjoy all the latest Apps, games, movies and more in breathtakingly sharp quality. Thanks to its massive 4000mAh battery you will now have enough juice to limitlessly browse the web and run all your favorite media files for up to 6 hours continuously without the fear of running out of juice anytime soon. Offering two SIM card slots and holding double IMEI numbers this Android phone allows you to stay connected to two phone numbers and 4G networks simultaneously. Increase your data connectivity significantly and ensure that you’ll always be within reach for your friends, colleagues, and loved ones. This Chinese smartphone offers the ideal platform to combine work and private life by using just one device and ensure you that you will always stay connected no matter where you’re headed. The Doogee F7 Pro has been equipped with a professional-grade 21MP rear camera that is capable of shooting mesmerizing images in both bright light and poor light conditions alike. Featuring PDAF technology this amazing camera allows you to take pictures much faster and stable compared to the vast majority of comparable smartphones out there. Make sure that not a single moment in life stays un-captured and gets forgotten – with this 21MP camera you can take mobile photographing to an entirely new level. The Doogee F7 Pro comes with a 12 months warranty, brought to you by the leader in Chinese Smartphones as well as wholesale electronic gadgets..